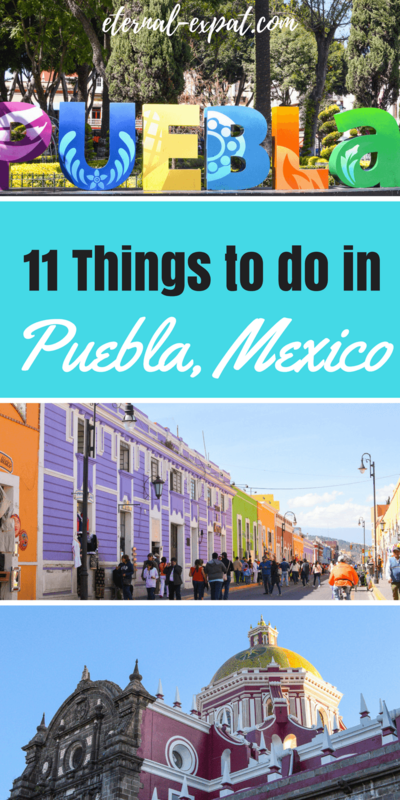 There are so many fun things to do in Puebla. We spent four days in the city, but I could have easily filled several more with museums, underground passages, and all the amazing food there is to try. 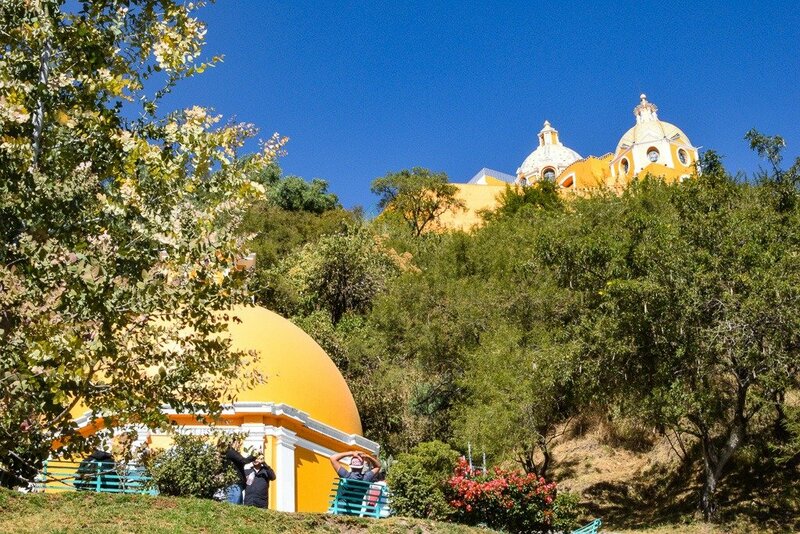 Puebla is so close to Mexico City – it’s only two hours away by bus. I’ve always put it off when we have a long weekend because I kept thinking that I would get to it eventually, it’s so close after all! Finally, during a four day weekend that we had in November (Revolution Day), Luke and I got up early and took the ADO bus south to Puebla. We booked ourselves into this cute, centrally located Airbnb place, and ate our weight in Poblano foods. If you’ve never used Airbnb before, get up to $35 off your first booking by registering with this link. 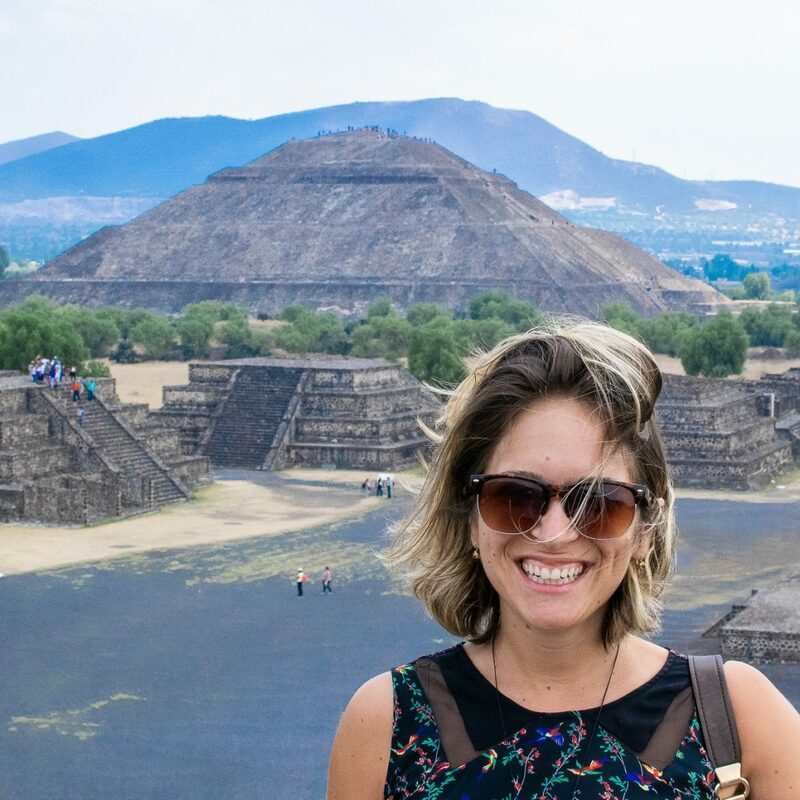 These were all of my favorite things to do in Puebla and a few things that we missed out on and wish I’d had more time to explore. The whole zocalo in Puebla is really nice. There’s a small park where you can sit in the sunshine or buy a balloon. The cathedral looks incredibly similar to the cathedral in Mexico City, but the inside is slightly different. It’s a nice place to start your tour of the city. This area is where you’ll find tons of great restaurants and bars. I found Puebla to be a really walkable city and I almost always ended up back near the cathedral, which looks lovely when it’s lit up at night. If you want to see ornate, you need to get over to this small, unassuming looking church. It’s along the main pedestrian street, Cinco de Mayo. There was a little bit of damage from the earthquake when we visited, so you could only enter through one of the doors, but you could still access the small chapel where you may go blind from cherubs and gold. I’ve never seen such a small space so filled with paintings, sculptures, and gold detailing. It’s one of the oldest chapels in the country, too. When I found out there was a cable car in the city, I was under the impression that it was leading UP to something. Well, that’s not really the case with this cable car, but it still offers pretty spectacular views over the city and it cheap and fun. You can take the cable car one way for 30 pesos or 50 pesos round trip. I only took it one way because I wanted to see the other side of the park. It’s only a short walk between the two cable car stations, so unless you are really set on going back the way you came, you only need to take it once. These forts are in the same park that the cable car is in, so it’s easy to do it all in one day. We walked from the city center to the park, it’s about an hour walk with a bit of uphill climbing thrown in. We took an Uber on the way back which was only about five minutes and 60 pesos. The park is really big and the two forts are quite different but definitely worth exploring. There’s also a free interactive museum where you can learn more about the battle that took place on Cinco de Mayo. It supposedly happened in the location of the fort of Guadalupe among other locations around Puebla. Of all the places I wish I had see in Puebla, this is the one I most regret not being able to go to. This library was the very first library in the New World. It’s packed with incredible volumes of history and literature and the interior is supposed to be stunning. Alas, due to the earthquake in September, the library was closed for repairs until the end of November 2017. Hopefully, it has now reopened and you can visit this little slice of history. This museum is fantastic. 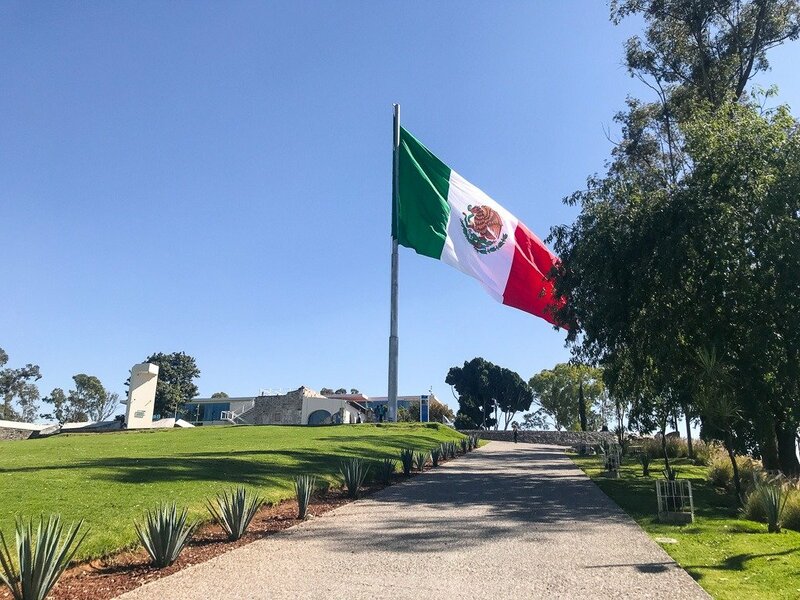 I was lucky enough to visit it for free, because the weekend I was in Puebla the city hosted a Museum Night (check before your trip as they usually have one once a month). The museum is packed with artifacts from pre-hispanic times up to the present day. There was an amazing section of modern art and on the roof top you can see out over the city, which looks pretty cool after sunset. This little area is a great place to head for unique souvenirs. The street is lined with small workshops where artists are painting, carving, sculpting, and sketching. It’s a nice pedestrian street to walk along even if you’re not interested in buying any art. This is a good place to start if you want to visit the next two places on the list. This is THE place to come if you want to get yourself some Poblano Talavera pottery. You’ve no doubt seen the blue painted pottery somewhere before, but this style of painting is originally from Puebla. There are tons of different stalls selling plates, mugs, teacups, platters, and bowls painted with beautiful shades of blue. There are also other types of typical Mexican souvenirs here like sarapes (wool blankets), jewelry, and leather shoes. This was one of my favorite spots in Puebla. 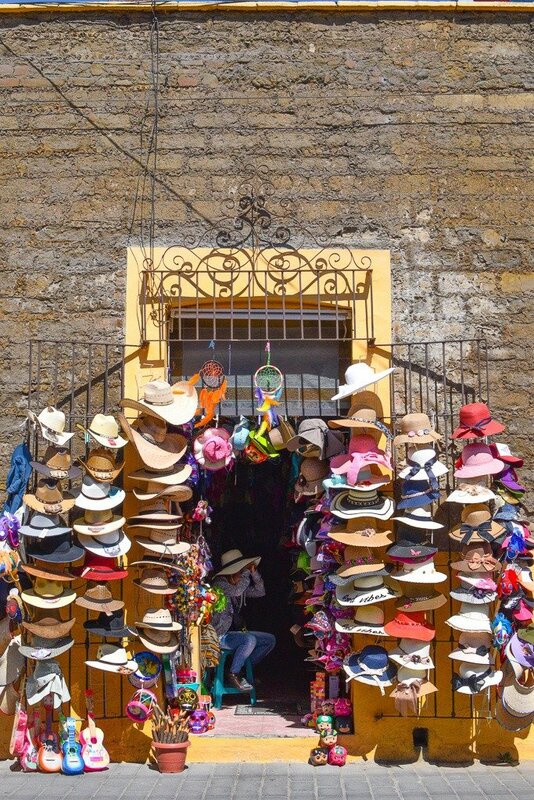 The streets around the plaza are lined with brightly painted buildings and in the main square is a huge antique market. You can literally buy anything and everything here: old dolls, antique cameras, picture frames, typewriters, cutlery, and random tchocka that you didn’t even know you wanted. 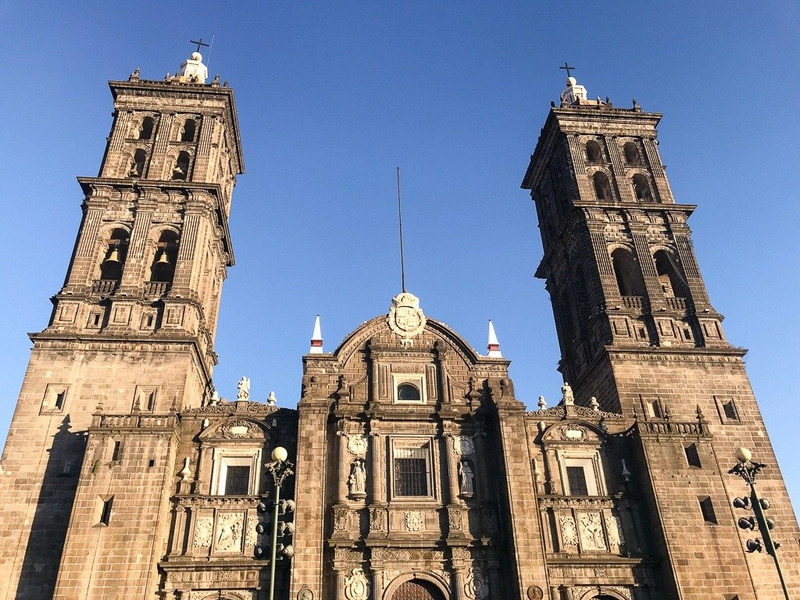 I didn’t know about the Secrets of Puebla until we got to the city and read about it in one of the city’s tourist pamphlets (never knock a tourist information center – they know things). You could easily walk straight past this building and not think you were missing one of the coolest sites in the city. It’s free to visit and most days you can get an English tour to learn more. We learned all about the colonization of the city and the seperation of the indigenous people and the Spanish. Then we got to go beneath the city’s streets and see a bridge that was built during the 17th century to cross over what was once a huge river (it has since been covered over and is a ring road around the city). You can also explore a series of tunnels around the city, but they are closed on Mondays, so, unfortunately, we missed out on the tunnels. Cholula can easily be seen in a morning. 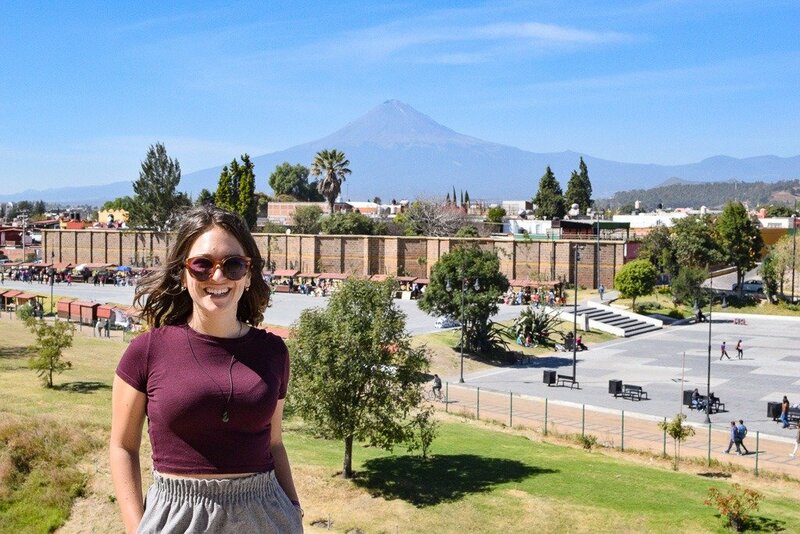 This little UNESCO World Heritage town is one of the main reasons I wanted to visit Puebla in the first place. The town is the site of the largest pyramid in the world (by volume) and it is also the widest pyramid in the world. 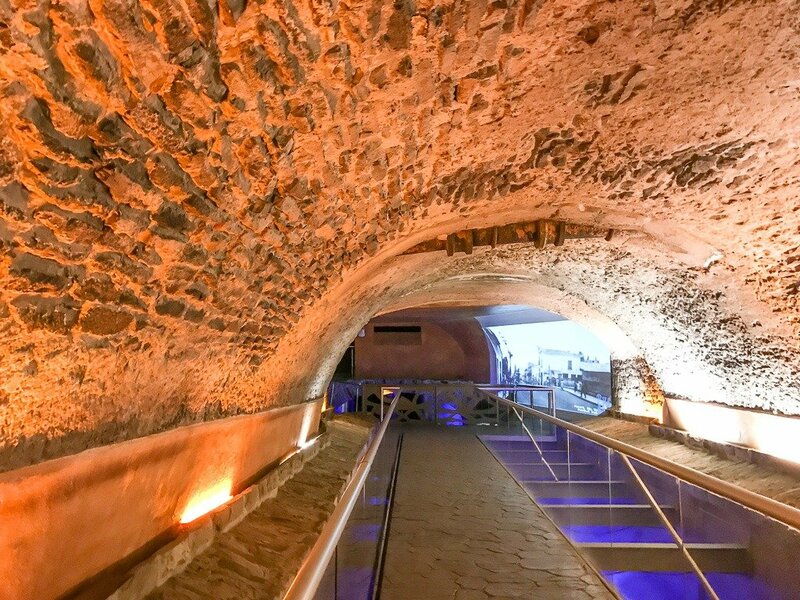 While most of it is now covered over by dirt and grass, you can still enter beneath hill and walk inside the pyramids intricate tunnel system. It is SO freaking cool. Once you come out of the other side of the tunnels, you can walk among a set of ruins that sits beside the pyramid. At the time of my visit in November 2017, the church at the top of the hill was closed off to visitors due to earthquake damage. You can still see the beautiful domes from ground level, but there is no news on when the church will reopen to the public. 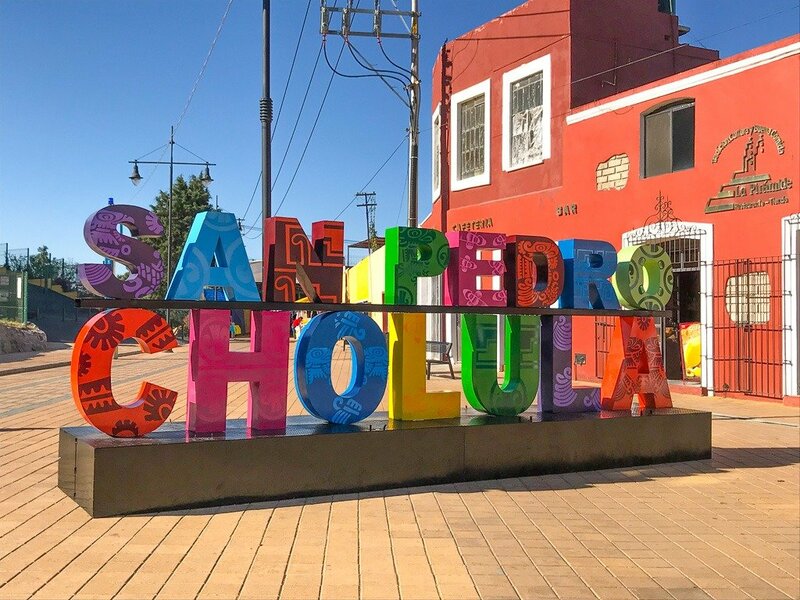 You can opt to pay for an English guide to take you through the ruins if you want to learn more about the history of Cholula, but I was quite happy to take my time wandering around the ruins and then exploring the town. 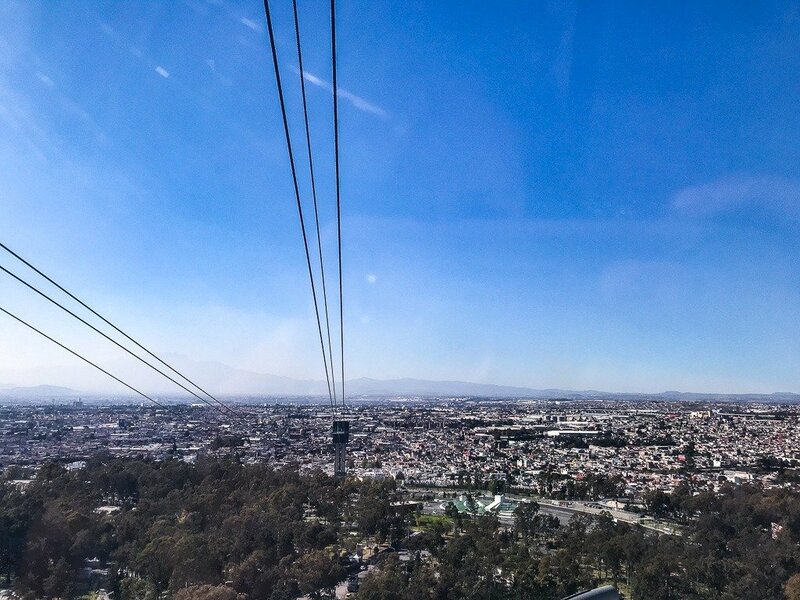 To get here from Puebla, there is a really easy and reasonably priced tram that you can take. It only leaves for Puebla twice a day and both times are incredibly early. We took an 8:30 AM tram into the town and by 1pm, we were ready to leave. Unfortunately, the first tram doesn’t head back to Puebla until 3:30pm. So we took an Uber, which was the same price as two tickets back to Puebla, so it worked out well in the end. The tram costs 60 pesos per person each way and is a nice way to get to the city before all of the crowds arrive at around 10am. Be sure to bring cash and try to have exact change for the tram.